We'll be at the following conference in the next few months - so come along and meet the SMSC team. With the current political climate leading to a rise in racism, it’s vital you are raising awareness of all strands of diversity, preventing discrimination and promoting equality to enable your students to appreciate the diverse society that they live in. 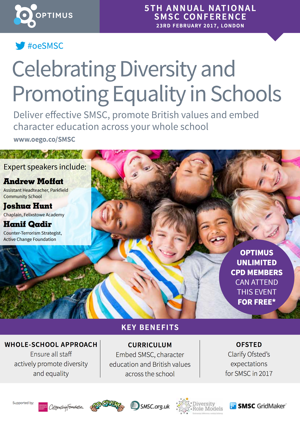 Our Celebrating Diversity and Promoting Equality in Schools conference will give you the knowledge and strategies you need to ensure SMSC (spiritual, moral, social and cultural), character education and British values are embedded across your school and that diversity is celebrated.